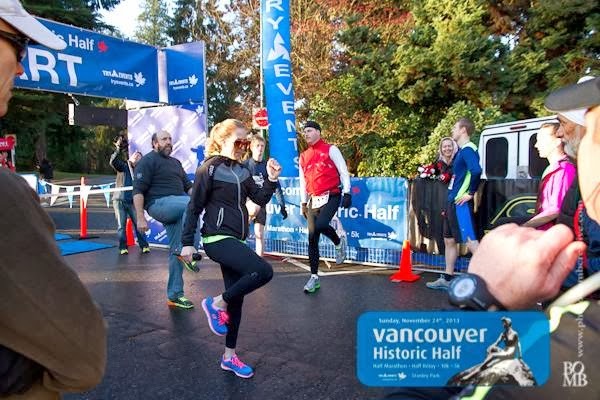 Sunday was the Vancouver Historic Half Marathon at Stanley Park and I was asked to lead the runners warm up. It was late Friday night when I got an email from my old employer, Skechers, who said the other girl had gotten sick and they needed a replacement. I had never led a warm up but thought it couldn't be that different from teaching boot camp. At first I was super nervous. What would people think? How would it work? Would people like me? All these thoughts that were roadblocks to a cool opportunity so I ignored the negative and agreed. I spent most of Saturday on Youtube watching "runners warm up" videos and I was starting to feel really good about this. I decided it was going to be a blast. 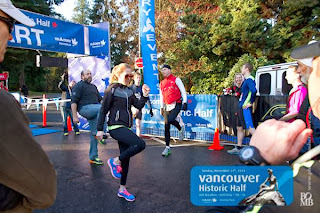 It was Sunday morning and I got all ready to head over to Stanley Park, cranked the tunes and went over my routine in my head. This was going to be awesome. I showed up and met with Alex from Skechers and he introduced me to the Race Director from the Try Events and the MC for the run. Everyone was super nice and the event had an amazing turn out. Trying not to think about the amount of people, they gave me the run down and it was almost time. 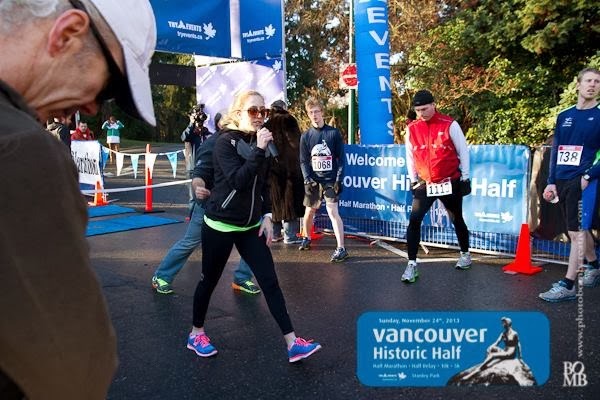 I was handed a mic, yes, they gave me a microphone and I was introduced to the group of runners. 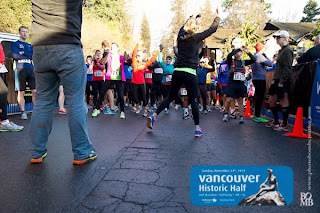 The music started and the next thing I knew is I was leading my first runners warm up. I tried to get the crowd awake and warm and was loving every minute of it. I think it was an out of body experience. This was the first warm up I had ever done and I can already list off a million things I would have done differently but now I know for next time and I want to do more of these in the future. A big Thanks to Skechers one of my brand sponsors and to Try Events for allowing me this opportunity and Congrats to all the runners. 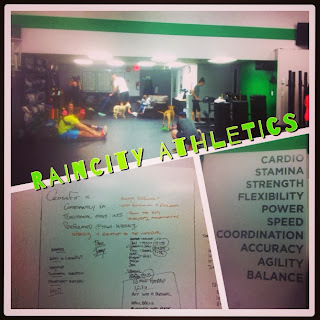 Yesterday was day four of my 30 day challenge and I had committed to trying a beginners Crossfit class at Raincity Athletics. A friend had recommended them and after visiting a few other Crossfit Gyms I was open to giving it a go. After downing my Vega pre-workout, I headed off to my class. Upon arrival, a group was wrapping up their WOD and man was it intense. I was breaking a sweat just watching this group. A mix of both men and women just destroying this workout. I waited in the back with the other beginners making small talk and introducing myself. It was a good group and I was starting to get really excited. We were all in the same boat. The class finished and Simon aka. Thor, the co-founder and our Coach called us over and started introductions. This place offers much more than just Crossfit. They have worked hard to create a sense of community which was very apparent by the three dogs hanging out in the back and a small child patiently waiting for his mom. I loved it. We went around the circle and did introductions, talked about Crossfit, did some dynamic stretching and talked about the WOD or Workout Of the Day we were doing. We were all partnered up and it was time to get started. 15 minutes later, I felt amazing! The workout was done and it was exhilarating. If you are interested in trying Crossfit, I highly recommend that you check out Raincity Athletics. I can't wait to go back. Stop by and enter to win FREE Canucks tickets as well as a $1500 makeover package! Vibes will be offering complimentary workouts, as well as featuring the latest Skechers and Tonic fall fashions. Losing your mojo, your inspiration, your motivation is totally normal! The key is to never stop looking for it. For months I have felt down but put on a good face for everyone but realized that instead of making myself happy I was really trying to find my own happiness. When we go through difficult times we will try about anything to find that place where we are confident, can't stop smiling and wake up every day with a mission. As some of you know that last few months have been a roller coaster. I moved back to Vancouver, started a job, moved, moved again, changed jobs, got engaged.....got unengaged and that's a lot to take in. That's also the first time I've really told anyone about being #unengaged. Most people are surprised how well I've taken everything and a lot of people don't find it normal how okay I am. I've had a lot of support but didn't think it was worth my energy to be sad about it everyday so I had a good cry, and said tomorrow I am going to get up and be in a good mood and I've done that every day since. My dad always said you are the only person who can wake up and decide if you are going to be in a good mood or a bad mood. So now that I've poured out my heart to you, you might better understand the slump I was in. I can't really describe what came over me or how it happened, if it was time or the fact that I never gave up on myself. The last three months haven't been my best as far as workouts because I have been really "busy," or at least that's what I've been telling myself. Even saying I'm too busy to workout sounds ridiculous. Going to the gym and getting into my zone is what I do and for the longest time I'd lost that passion for something that made me feel so good. I would think about going and could envision how amazing I would feel after a good sweat sesh but physically I never made it. Maybe one of the reasons, well two reasons I got my mojo back is one because I never gave up on myself and two because I had accepted that I was okay and that I was ready to get my life back. Last week I went to the library and took out 5 books by Jillian Michaels, my idol, and the first one I picked up was her book called Unlimited, How to Build and Exceptional Life. I've just started it but I feel like its talking, allowing me to respect that I needed time but now I need to get on with life and get back to the things that I'm passionate about. For me having the gym and fitness as an outlet is one of the most important things in my life as I've found it's the best way to fight depression as I refuse to take medication. The gym is my medicine and when I get there and put my headphones on I am in a totally different world. It's my time and once I found fitness, I found my voice and my confidence. My home. It's one of the most rewarding things I can do for myself. If you've ever felt lost, or unmotivated I can relate to you and tell you it's okay to feel that was as long as, yes there is an exception, you don't give up on yourself. Don't be too busy, or too tired, or too anything to put yourself first. Make time to get to the gym or whatever it is that you are passionate about because once you accept it, you will find what you are looking for. Last night I didn't want to go to the gym, but I made a conscious decision and after much debate found myself sweating out 30 minutes on the stair climber with my 10lb ankle weights and then another 50 minutes of lifting. I was back. I am back. I have found my passion for sweat and lifting. It feels so good and I hope if you have been in a slump that you keep pushing to find that break through cause it's right around the corner. Its a long road but know that other people are on it too. This was a very personal thing for me to share but I think it's important to know that others are out there going through the same thing. No one is perfect. I'm definitely not. Eat. Sweat. Smile. Repeat and tell someone how awesome they are today. Nicole - I'm back baby!